A sub-mission of Mission San Luis Rey de Francia in Oceanside, San Antonio de Pala Asistencia is an active Catholic church that serves the Pala Indian Reservation in San Diego County. We've passed by the turnoff to the Asistencia several times while traversing Hwy. 76, but never had a chance to stop by for a visit. So for now, this post is a placeholder until we make a trip there. 5/19/17 Sign for the mission at Pala Casino. 18 June 1816. Padre Peyri dedicated the Pala Asistencia. It became prosperous and up to 1,300 converts were ministered to from dedication to the time the mission system went into decline. 1818. A town started to take shape around the Asistencia and after three years Padre Mariano Payeras noted that all that was lacking to make Pala a complete mission was a resident priest. 14 November 1845. 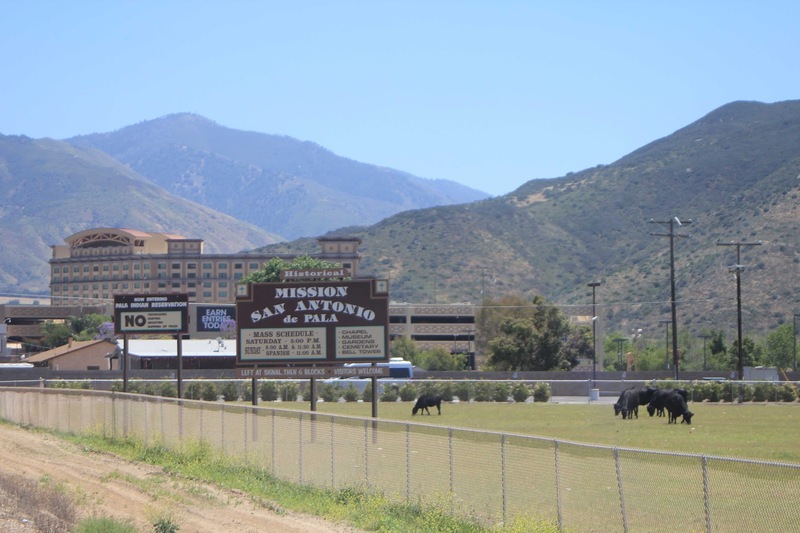 Pala, along with Mission San Luis Rey, was sold to Jose A. Cot and Jose A. Pico. That sale was later nullified but it started a process of sales of various mission properties. Fortunately, Pala was located away from the main lines of travel at the time so the Indians were able to keep the chapel and some of the grounds in repair. 1899. An earthquake damaged the chapel. It was repaired by the Indians with the help of the Landmarks Club.Likewise, when a flood damaged the campanile, it was rebuilt by the Indians. 1902. The U.S. Government decided to remove Indians from the Warner’s Ranch area. Property near Pala was purchased and used for this move in the Spring of 1903. 1903. The Asistencia was returned to the Catholic Church through the Landmarks Club which has been able to purchase it from a private owner. 1954. Father Januarius Carillo started a restoration program where original bricks would be made and used to rebuild the original quadrangle. Cedar logs were brought from the Palomar Mountain for this reconstruction. 1959. The restoration of the original quadrangle was completed. 1992. The chapel underwent extensive restoration due to termite damage in the roof.